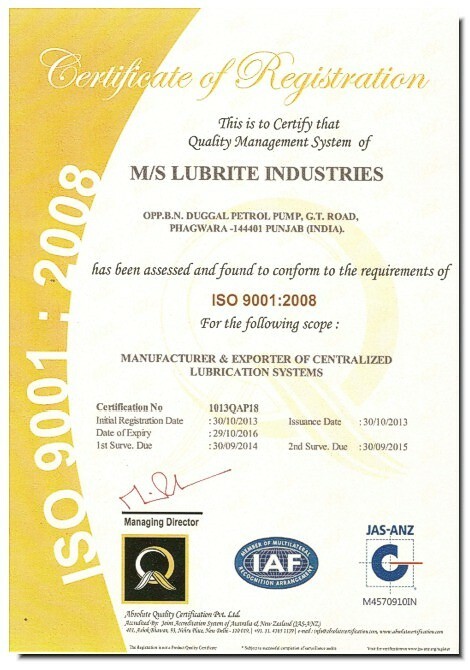 Lubrite Industries is an ISO 9000:2008 Certified Company engaged in manufacturing and exporting top quality Centralised Lubrication Systems from India. 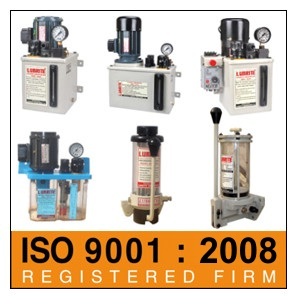 Ever since the inception (in 1975) Lubrite Industries has been a client-centric organization that emphasizes on delivering high quality range of centralised lubrication sytems, industrial pumps, automatic lubricators, industrial timers, controllers, drip feed oilers, lubrication systems and pumps. In order to ensure this goal, we have appointed an efficient team of quality controllers engaged in performing various activities for maintaining and improving our quality standards. Our quality controllers conduct a stringent quality check of our complete product range as per the well defined quality parameters. We are ISO 9001:2008 Certified Company. Being a client centric organization, Lubrite Industries believe in delivering a top quality Lubrication Product range with high efficiency and according to the clients' specific needs. Our professionals work in proximity of our clients in order to understand their exact requirements. We have strictly directed all our professionals to follow international quality standards to ensure high quality of final products. Our organization is committed to deliver the clients' orders within the given time constraints. We are associated with a wide distribution network which helps us in meeting our commitment of safe and timely delivery.